Hello? I'm back! I went to Florida for a family vacation last week and had a great time. It was a little cool for Florida (60's - 70's) but anything is better than below zero! It was -8 when we got home...welcome back to Minnesota! This is Julep Marion from my February "It Girl" box. Marion is described as a smoky blue with silver shimmer. The formula of this was pretty dense. 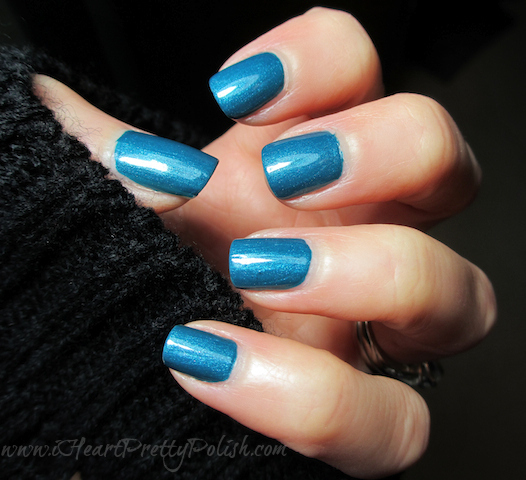 For those of you who like using one coat, this polish would probably work better for you. But because I always use two, it was a little hard for me to apply evenly. And the brush seemed a little wide - I don't remember that with other Juleps. Perhaps it seemed bigger because the polish was so thick. All in all, this is a pretty color if you like brighter teals. It's not really that unique to my collection and isn't my favorite color to wear. If I wear teal, I like a more muted shade. It doesn't seem as "smoky" as they described. I hope you are all doing well. I miss talking to you! Join the Friday Linkup! All are welcome! Glad you got to enjoy some nicer weather for a bit. -8 is too cold for me. I really love this polish. Teal is my favorite though so it was to be expected. Yes, it's a very pretty shade:) Thanks for stopping by! Great swatches as always, unique shade or not. Do you use a lightbox for your photos? that color is so in right now! looks pretty! Yes, it's a pretty color. Thanks for commenting! It's a pretty teal, isn't it? Thank you. We did enjoy it but it's always nice to be back home too:) I take it you can't get Julep in your country...? That would be a great excuse to go shopping, right? :) And shhhhhh, we aren't discussing my nails....I'm trying to ignore the fact that they haven't broken in a while....fingers crossed. Agreed -- It's a nice colour but not nice enough to be one of my faves. And I think Julep started making wider brushes now, which I like because I have big nail beds, but I also find that when the polish is think, it's harder to apply. All in all, I like Julep polishes but China Glaze is still my fave. You know what, I don't have many China Glaze - but the ones I have I do like. I need to try more! Yes, it is pretty:) Thanks for commenting! Such a gorgeous color. I wish Julep was better quality because their colors are so pretty!